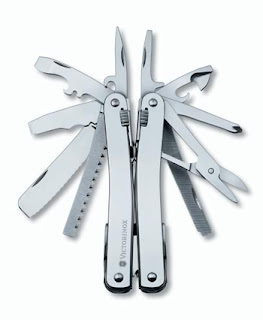 The "Spirit" is one of the most popular multi-tools from SAK manufacturer Victorinox. The list of tools the Spirit has includes needle nose pliers which are very good with soft wire cutters and hard wire cutters. It has 2, 3 and 6mm flat screwdrivers and phillips screwdrivers. Scissors of very good quality with plain edges. Can opener, chisel, bottle opener, wire stripper, metal saw, wood saw, awl and a file. There is no knife in the Spirit, the serrated saw can be considered a serrated knife and it is very sharp but serrated as it is works better as a saw than as a knife. All the tools in the spirit lock with a slide-release mechanism in the handles and as seen in the picture all the tools but the pliers can be opened without opening the tool. Some of the tools in the spirit are very unique and particular, the chisel/wire stripper is certainly a very nice tool that you will probably use a lot, combined with the prytool you have a lot of options for prying and scrapping. The screwdrivers are very good with the nice detail of the long neck in the philips one to reach screws embedded in holes. The slightly curved handles are ergonomic, maybe a little slippery being made of metal without any knurling the tool has a very sleek look and feel that will automatically trigger a love or hate feeling from the user, there are no middle points. The spirit offers innovative design and a very interesting set of tools, the absence of a knive can be great for those that already carry a knife of their preference enjoying the extra set of tools the spirit has. A complete package with excellent quality and a nice design for a very affordable price make the Spirit one of our top choices along with the Leatherman Charge Ti for a multi-tool. The Spirit comes in a leather pouch and can be ordered from Amazon for $60.